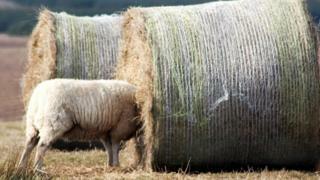 A photograph of a sheep with its head stuck in a bale of straw has become a social media hit. Graham Findlay, of Peterhead, spotted two sheep in either end of the bale near Cruden Bay in Aberdeenshire, so drove home to get his camera. One still had its head inside when he returned. Mr Findlay, 57, told BBC Scotland: "You try to put your best pictures out there and then a quirky one like this goes 'whoosh'." Mr Findlay, who works at Peterhead Prison Museum, added: "We came round a corner and saw a sheep at either end of the bale. "We went home, picked up the camera and went back. It was just the one sheep by then. "I wish I had got the two of them, but I posted the picture on Facebook and it already has more than 1,500 likes. "The photo was too good an opportunity to miss. I did not realise there would be such an interest, but it's keeping people amused. "I assume the sheep got out after feeding, as the other one did."